Note to readers... this discussion of slotted line measurements is here mostly for historic value. It will help you understand why microwave engineers use voltage standing wave ratio (VSWR) as a requirement, even though a "more modern" way to measure impedance mismatches is to measure S-parameters using a network analyzer. New for April 2014: Here's a video on slotted line measurements using an HP 415E SWR meter, featuring Erin at UC Berkeley. 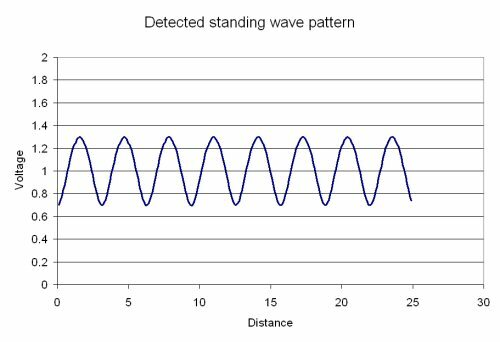 You can see how the wavelength of the signal is measured, but unfortunately the standing wave ratio is not actually calculated. New for September 2013: Kerry explains the HP805A slotted line! 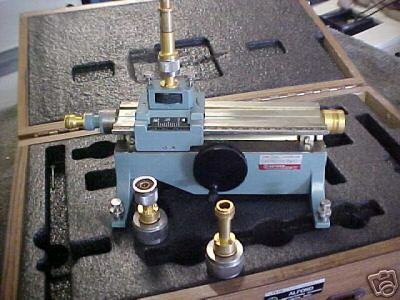 Thanks to Chuck we now know how to measure load impedance using the slotted line. Not that long ago, in a time before network analyzers, engineers of yore used something called a slotted line to measure voltage standing wave ratio. You might turn up such an instrument if you work in a lab that is more than 25 years old. Basically it is a coax line with a slot down one side where a probe can be moved longitudinally to measure varying electric field strength. The probe has a detector that converts RF energy to DC voltage, so you can measure peaks and valleys using an voltmeter. For circuits that were extremely mismatched (or open or short circuited), the peaks and valleys are the most noticeable. The ratio of the peak voltage to the valley voltage was the most directly calculated piece of data you can get with a slotted line... hence "voltage standing wave ratio". Using a slotted line, you could also measure an unknown frequency by measuring the distance between the voltage peaks and noting that the distance is 1/2 wavelength. In this case, the peak voltages are about 1.3 volts and the nulls are about 0.7 volts. That's a standing wave ratio of 1.85:1. What else can you tell from this measurement? You can measure the frequency of the source (if it was unknown), if you know the dielectric constant of the slotted line (1 if it is air dielectric). The distance between nulls is a half wavelength. You should always measure between the nulls, not the peaks, because they are much sharper and easier to discriminate in distance (in spite of the above graph where they look the same!) From the plot, if the X-axis is in centimeters, we could estimate a wavelength of 6.25 cm (four wavelengths in 25 centimeters). Just divide that into the speed of light (30,000,000,000 cm/s) and you will get an answer of 4.8 GHz. Thanks for the correction, Renato! If anyone has further interest in the topic of microwave measurements as they were done in the 1960s, we recommend this book : "MICROWAVE THEORY AND APPLICATIONS" by Stephen F. Adam of Hewlett Packard, you can probably find a used copy somewhere. Or just borrow a copy from an old dude out in your lab! This info came from Chuck... thanks! You can measure impedance of the load with the slotted line. After you measure the VSWR and draw the VSWR circle on the smith chart, you can mechanically measure the distance from the unit under test to the probe (parked at a peak or null) Then replace the load with a short or open and measure how far you have to move the probe to the new peak or null. Convert the length to wavelengths and rotate the appropriate way around the smith chart. Good stuff (I didn't think so as a student, but I do now). The following description came from Kerry, thanks! HP and others made a wide range of slotted lines; others were made in labs and workshops as one-off projects. The HP805A (later 805C) was perhaps the lowest frequency slotted line made in commercial production; its rated range is 500mc to 4000mc (as the manual expresses it). Since waveguide is not common at those frequencies the 805A has N connectors, male at one end and female at the other. 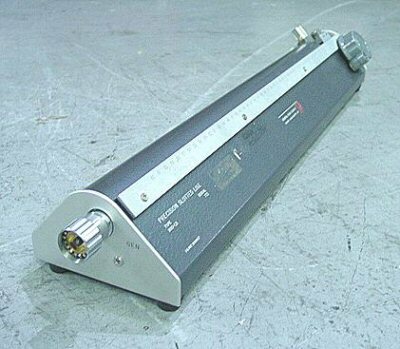 A slotted line section should be a minimum of about half-a-wavelength long so, to reach the low limit, the instrument has a slotted section 450 mm long and is about 26” long overall. Although the large sections are cast & machined aluminium it still weighs a hefty 18 lbs. This type of line was suggested by John Woodyard and brought to fruition by Wholey and Eldred. The 805A’s sliding carriage contains a probe to detect the electric field in the line; probe length is adjustable to ensure minimum loading. A crystal (diode) detector and a high-impedance voltmeter register the electric field; a refinement was a HP 815 SWR meter which is, in essence, an audio voltmeter tuned to 1000 Hz which responds to 1000 Hz modulation impressed on the microwave signal. The slotted line measures voltage along the line; this is why standing wave ratio is often expressed as VSWR. 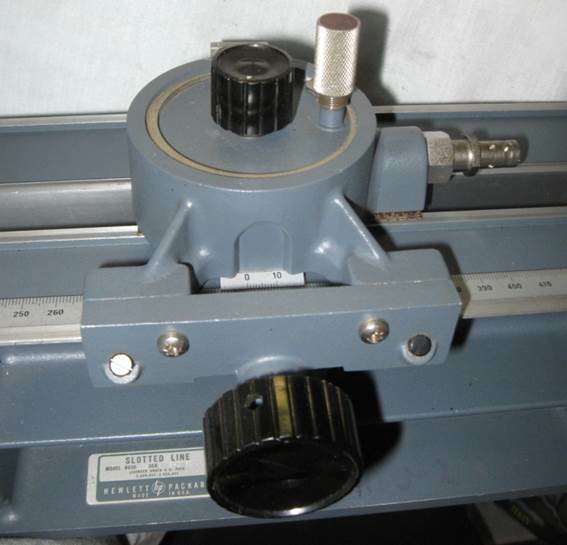 Slotted lines were also used to measure frequency by measuring a half-wavelength of the signal; not very accurate but that was all that the microwave pioneers had in those days. An 805C cost $525 in 1966.